It's time again for Secret Recipe Club reveal! My secret blog assignment this month is The Wimpy Vegetarian. Susan is a mostly vegetarian (hence the 'wimpy') married to a meat-loving man. Sounds like quite a challenge, doesn't it? Susan has met that challenge head on, finding healthy ways to pump up the flavors of her vegetarian dishes and making things tasty and interesting enough that her husband began eating more of her vegetarian 'horse food' - alongside his meat - and even going back for seconds. and because this one was a previous SRC post, I can't use it here, but I am definitely going to have to make this Mac 'n Cheese Impossible Pie. When I saw the recipe for this salad, I just knew it was the one. I had never thought to use lentils in a salad, though I love them in soup, so I was definitely intrigued. 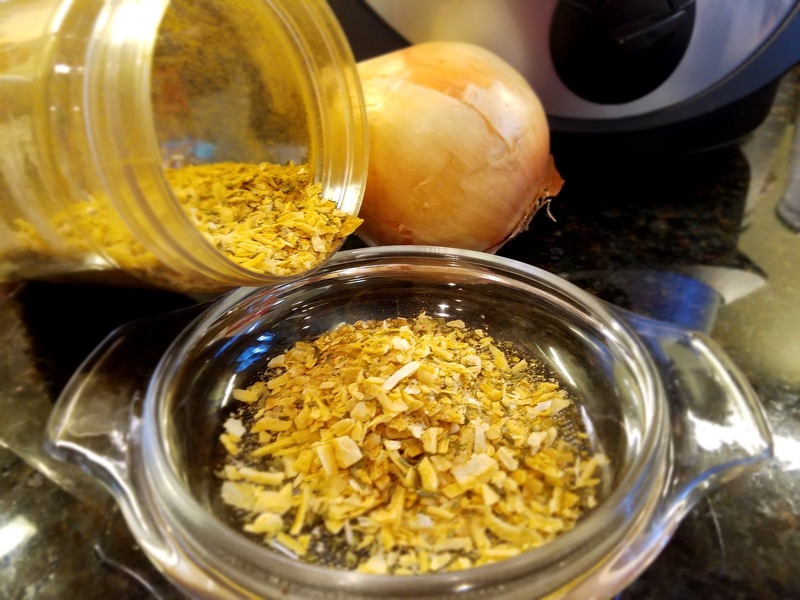 I also had a potluck to prepare for and thought this would be good for that because it's a great make-ahead dish that gets better as the flavors have time to blend. 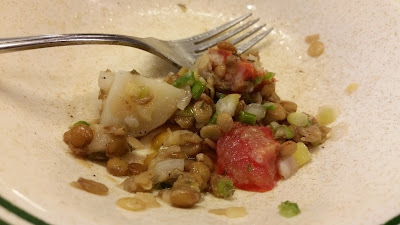 Cook lentils according to package directions, just until tender (15-20 minutes). Drain and cool. Cook potatoes until tender. Cool and dice. 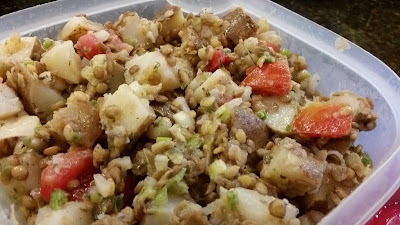 Mix lentils, potatoes, onions, jalapeno, celery, and parsley in large bowl. 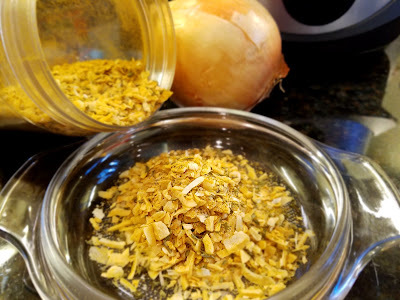 Whisk together the vinegar, oil and seasonings for the vinaigrette; toss together with salad. Add diced tomatoes and toss gently. Serve immediately or refrigerate to serve later. Toss gently before serving as the vinaigrette tends to settle to the bottom. Susan indicated that her recipe would serve 2 (I'm guessing as a vegetarian main dish), so I doubled everything, needing enough to take to the potluck and share. It made a very nice sized salad, and I even had leftovers to bring home, so I was able to enjoy it with my lunch several days the rest of the week. Yeah, it made a lot. 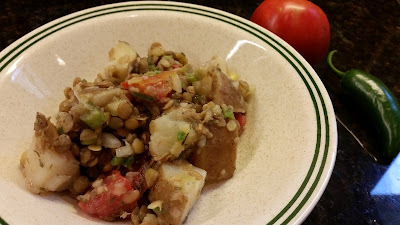 This salad turned out quite tasty; I really enjoyed the combination of potatoes and lentils. It is very good on its own or as an accompaniment. Susan's recipe called for fresh parsley and rosemary, but I settled for dried since that's what I had. I also used diced tomatoes instead of cherry tomatoes, because I am getting tomatoes out of my garden now, and I wanted to use some of those. Oh, and also used a jalapeno because I'm getting a bunch of those from the garden too. As always, I think that's the best way to cook - use what you have on hand! The only thing I think needed adjusted was the salt, so just taste and adjust seasonings according to your own taste. Susan boiled her potatoes in well salted water (which I only just noticed when I sat down to post the recipe), and I baked mine in my crockpot, so I'm sure that made a bit of a difference.